Friday, January 22 – with Ray Obiedo & Mistura Fina at Silo’s, Napa, CA. Brazilian and Latin jazz mixed with East Bay funk, featuring singer Sandy Cressman. With Ray Obiedo – guitar, Marc Van Wageningen – bass, Phil Hawkins – drums, and Derek Rolando – percussion. 8 pm. Friday, February 12 – with Latin jazz legends Pete and Sheila Escovedo (Sheila E) at Jazz at the Oxford, Bend, OR. Sunday, February 14 – jazz and Brazilian music with singer Sandy Cressman and bassist Fred Randolph at The Ritz-Carlton, Half Moon Bay, CA. 6-9:30 pm. Friday, March 18 – with Ray Obiedo & Mistura Fina at The Sound Room, 2147 Broadway, Oakland, CA. Brazilian and Latin jazz mixed with East Bay funk featuring singer Sandy Cressman. With Ray Obiedo – guitar, Alex Murzyn – sax & flute, Marc Van Wageningen – bass, and Colin Douglas – drums. Music starts at 8 pm. Saturday, March 26 – with Ray Obiedo & Mistura Fina at Armando’s, Martinez, CA. Brazilian and Latin jazz mixed with East Bay funk, featuring singer Sandy Cressman. With Ray Obiedo – guitar, Alex Murzyn – sax & flute, David Belove – bass, Phil Hawkins – drums, and Derek Rolando – percussion. 8 pm. Friday, April 22 – with Ray Obiedo & Mistura Fina at Cafe Pink House, Saratoga, CA. Brazilian and Latin jazz mixed with East Bay funk, featuring singer Sandy Cressman. With Ray Obiedo – guitar, Alex Murzyn – sax & flute, Marc Van Wageningen – bass, and Phil Hawkins – drums. Music starts at 7:30 pm. Saturday, May 29 – with The Pete Escovedo Latin Jazz Orchestra at The Saddle Rack, Fremont, CA. A fundraiser event for Make-A-Wish Bay Area. Thursday, June 16 – with The Pete Escovedo Latin Jazz Esnemble at Montgomery Village, Santa Rosa, CA. Part of the Concerts Under the Stars series. Saturday, June 18 – with The Pete Escovedo Latin Jazz Orchestra at the Juneteenth in the Park Festival 2016, Discovery Meadow, San Jose, CA. We’ll be Saturday’s headlining act for the 35th Bay Area Juneteenth celebration. Sunday, July 10 – with The Pete Escovedo Latin Jazz Orchestra at Todd Grove Park, Ukiah, CA. Part of the Sundays in the Park concert series. Free. Music starts at 6 pm. Friday, July 15 – with The Pete Escovedo Latin Jazz Orchestra at Angelica’s Bistro, Redwood City, CA. Music starts at 8 pm. Saturday, July 16 – with The Pete Escovedo Latin Jazz Orchestra at UC Theatre, Berkeley, CA. Pete’s Birthday Dance Celebration featuring Juan and Peter Michael Escovedo. Music starts at 8 pm. Sunday, July 17 – with The Pete Escovedo Latin Jazz Ensemble at the White Crane Winery, Livermore, CA. Saturday, August 6 – with The Pete Escovedo Latin Jazz Esnemble at the Red Clay Jazz Festival, Kauai, Hawaii. Sunday, August 14 – with Conjunto Karabalí at The Sausalito Seahorse, Sausalito, CA. Ten-piece all-star salsa band led by percussion masters Karl Perazzo (of Santana) and Michael Spiro, and featuring Santana brass Bill Ortiz (trumpet) and Jeff Cressman (trombone). Music starts 5:00 pm. Saturday, September 3 – with Ray Obiedo and Mambo Caribe at Jazz In The Park, Bramhall/Willow Street Park, San Jose, CA, presented by the San Jose Jazz Festival. Latin and Brazilian jazz. Music starts at 6 pm. 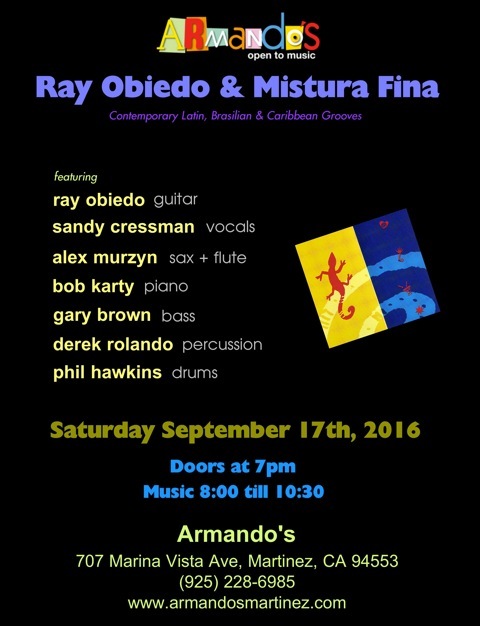 Saturday, September 17 – with Ray Obiedo & Mistura Fina at Armando’s, Martinez, CA. Brazilian and Latin jazz mixed with East Bay funk, featuring singer Sandy Cressman. With Ray Obiedo – guitar, Alex Murzyn – sax & flute, Gary Brown – bass, Phil Hawkins – drums, and Derek Rolando – percussion. 8 pm. 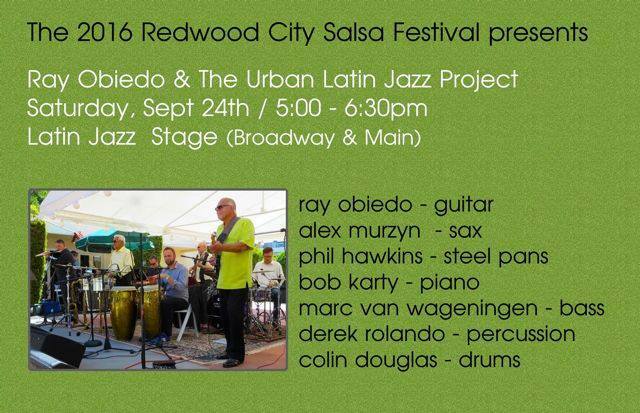 Saturday, September 24 – with Ray Obiedo’s Urban Latin Jazz Project at the Redwood City Salsa Festival, Redwood City, CA. With Ray Obiedo – guitar, Alex Murzyn – sax & flute, Marc Van Wageningen – bass, Phil Hawkins – steel pans, drums, Colin Douglas – drums, and Derek Rolando – percussion. 5 pm on the Latin Jazz stage. Friday, November 18 – with the Pete Escovedo Latin Jazz Orchestra at the Historic Bal Theatre, San Leandro, CA. Music starts at 8 pm.